New measures to remove the bureaucratic burdens faced by community groups wanting to set up a town or parish council. Communities Minister Stephen Williams today (8 January 2015) set out new measures that will remove the bureaucratic burdens faced by community groups wanting to set up a town or parish council and give local people a greater say over what goes on in their neighbourhood. Town and parish councils allow communities to take control of local assets, deliver local services and influence decision-making and priorities. The government wants the experience of creating a town and parish council to become easier for those local communities that believe they would benefit from them. Over the last 3 years, the government has engaged interested parties both informally and through formal public consultation. The feedback gathered finds that the existing legislation can be burdensome and often discourages local campaigners. To help cut this unnecessary bureaucracy the government has formulated 3 new measures that will cut red tape, improve the legislative process and help town and parish councils to play a stronger role in the delivery of local services. We want more people to have the opportunity to take control and have a greater say over what goes on in their neighbourhood. Parish and town councils have a crucial role to play, having both a democratically accountable voice and a structure for taking community action. However, the current obligations can stifle local campaigns and constrain local democracy. That is why we are changing the rules and helping campaigners by making it much easier to set them up so they can get on and start making a difference for their local communities. Local (parish and town) councils are popular with people and can really make a difference, and for too long communities have battled with burdensome bureaucracy to get them created. The proposals to remove red tape, simplify and streamline the current process is a common sense move. We welcome the continued impetus on the creation of more new local councils to deliver services to local communities and give them a voice. The government’s measures are a step in the right direction to help people and communities create these most local of democratically accountable councils. Now communities can get on with delivering grassroots level services and representation by taking local action. Today the government published its response to the consultation on a proposal to use a legislative reform order for making it easier to set up a town and parish council. The legislative reform order has been laid in parliament and we expect that these new rights will come into force within the next 12 months. The government is committed to empowering local governance as close as possible to local to communities. The Localism Act 2011 gives parish councils a range of powers to help address the problems they want to address and many are now taking control and having a greater say over what goes where in the neighbourhood. 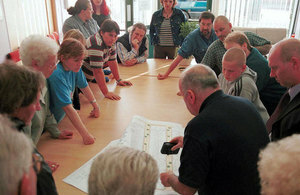 There is huge potential for more parishes to make use of community rights and from our survey of parishes over the summer, it was clear that there have been significant increases on last year in the numbers engaged in neighbourhood planning, taking control of much-loved local assets and taking on services from local authorities. See the draft order accompanying this explanatory document setting out the 3 amendments proposed for the legislation. The current process for triggering a review to create a town and parish council is initiated by either the local authority choosing to carry out a review, or by local campaigners petitioning the local authority. Once a review has been triggered, the local authority must then set the terms of reference, including deciding what geographical area it should cover. The review then needs to be completed within 12 months. However, the timetable does not include the time taken by the local authority to complete preparatory work or setting out terms of reference. Consequently, it is not uncommon for the entire process to take far longer than 12 months. While the government is committed to supporting the establishment of town and parish councils, it strongly believes that councils should not be imposed on communities and only created where sufficient community support exists. Equally, the government does not wish to see the break-up or dissolution of parish councils against the wishes of the majority of the local community. For this reason, the new measures will not erode the safeguards in the legislation or result in unsupported changes to communities. There are nearly 10,000 civil parishes in England. However, they typically exist in village and market town settings and less commonly in urban areas. So only 37% of the population in England is covered by a parish council. On average, since 2010, around a dozen parishes have been created each year, but only a small number of these, around a quarter, are new parish councils in previously unparished areas; the remainder are parishes created as the result of splitting or merging existing parishes or changing the boundaries of existing parishes. There are currently 33 live campaigns and nearly 100 communities considering campaigning for a parish.